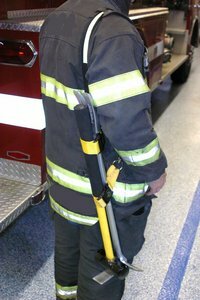 " The Original Adz Maul "
The Adz-Splitting Maul is married to the Adz-Bar with the Shoulder Strap System (#SSSYS). 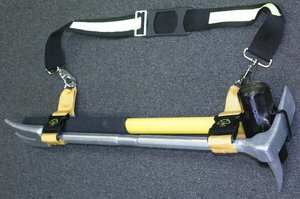 The Splitting Maul Head has the Adz Bracket for attachment and a 28" fiberglass handle with Celtex grips. This is a complete entry system. The Adz-8-28 Pro Set consists of the Pro-Bar 30, which is married to the 8 lbs Sledge Hammer with Adz bracket (#8-M28-B) along with our Shoulder Strap System (#SSSYS). The Sledge has a 28 inch fiberglass handle with Celtex grips. This pair is a forcible entry MUST for any truck or rescue company. 6 lbs. 28-inch Splitting Maul with ADZ bracket and celtex grips. Made to marry ADZ Bar 31" or Pro-Bar 30" with our new Shoulder Strap System (SSSYS). 8 lbs. 28inch Sledge with ADZ bracket and celtex grips. 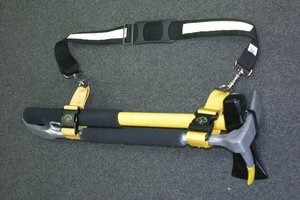 Made to marry ADZ-BAR 31" or the PRO-BAR 30-inch with our new Shoulder Strap System (SSSYS). 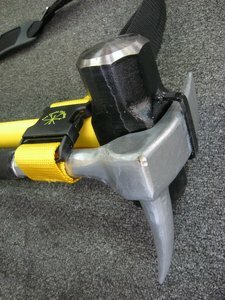 An unbreakable striking tool! It is solid steel throughout and is 28-inches long. Has a 8 lbs. sledge head with with an Adz bracket. The shaft is made with a Pro-Bar hexagon steel body. Its shaft has a Adz forxible entry end for prying. Weight is 12 lbs. making it perfect to strike against a Pro-Bar (Halligan). A great marriage. Can be ordered with a shoulder strap.